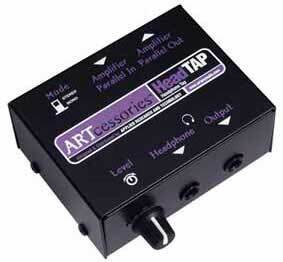 ART HeadTAP, Sometimes floor monitors are a problem. There isnt enough room for them onstage or someone sits in and cant hear the monitors or the drummer cant hear them well enough. Or perhaps its a pick-up gig or a rehearsal and you didnt have enough time to set them up. In any case, sometimes it would be preferable just to put on headphones and somehow connect them to the PA. Thats where a headphone tap comes in. This is a passive device with an input to connect the PA or monitor amplifier and an output to connect the headphones. A volume control regulates the headphone level and internal resistors keep the units impedance high enough to protect the headphones. It also protects the amplifier from encountering too low a load impedance while powering tap units, the speaker system or several tap units by themselves. 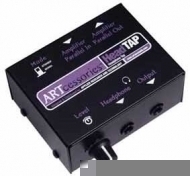 The HeadTAP will also work with a stereo headphone amplifier for use in recording situations when you want to add headphones for additional performers.